A 35-year-old businesswoman, Rose Eitus, who was nabbed allegedly in possession of one locally-made single barrel short gun, yesterday appeared before an Ikeja Chief Magistrates’ Court. 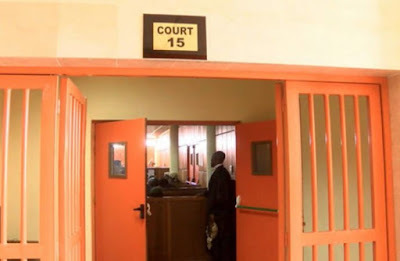 Eitus, who lives at 6, Agboworin Street, Ketu, Ijanikin in Lagos, was arraigned on a two-count-charge of conspiracy and unlawful possession of firearms. The defendant pleaded not guilty. Prosecuting Sergeant Michael Unah alleged that she conspired with others still at large, unlawfully having in their possession a locally-made gun with one live cartridge. Unah said Eitus could not give a satisfactory account of how she came about the firearms. The prosecutor said the defendant committed the offences on February14 at 10.00 p.m., at her home. “A team of police officers got information that a group of boys were smoking Indian hemp at the defendant’s shop. “This generated fear in the neighborhood and the police officers were alerted. “The said boys took to their heels upon sighting the police from afar, while the defendant was arrested after a gun with one live cartridge was found behind her freezer,’’ he said. Chief Magistrate A.A. Fashola granted the defendant N200,000 bail with two sureties in the like sum. He said the sureties must be employed with an evidence of two years tax payment to the Lagos State Government and have their addresses verified by the court. The magistrate said the sureties must be relatives of the defendant and reside within the court’s jurisdiction. The case continues on April 16.